Saltergate Junior pupils enjoyed out of this world experiences without leaving their school hall or spending a penny. The Harrogate school travelled to outerspace, deep sea dived in Fiji and went sightseeing in Dubai through Google Expeditions which uses virtual reality panoramas - 360 degrees photo spheres, 3D images and video. 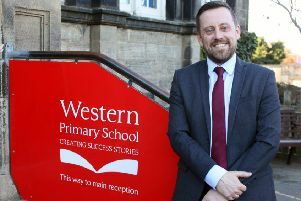 “With whole classes engaged at one time, a cardboard viewer and modern smartphone allow pupils to explore independently and offer teachers the opportunity to enhance and tailor this experience using a synchronised tablet,” said a school spokesman. “Jumping between hundreds of places and environments in seconds, the technology quickly showed us opportunities for deepening understanding (particularly in geography and science) in remote locations we have often relied on text books to inform. “By being immersed in the environment, pupils could make observations, share ideas and ask questions without needing to leave the classroom. “Nothing will ever replace the real-life experience you can gain by visiting somewhere in person, but the opportunity to explore and understand the world we live in just got a lot more accessible, cost effective and quicker for us.